Apple iOS device users including iPad and iPhone can purchase different applications and games on their Apple devices. Every purchase require you to enter Apple ID login details for successful order and download of apps. Over a period of time you may have purchased number of Apps for your Apple iOS devices. Do you want to view and track your app purchase details? 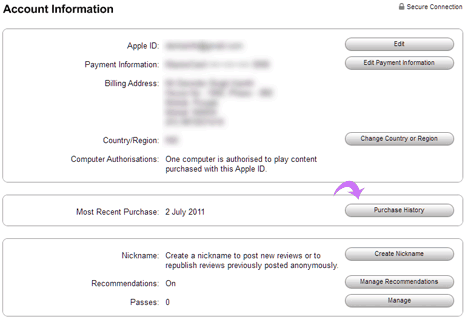 This can be easily done in iTunes program by logging into your associated Apple ID account details. 1. 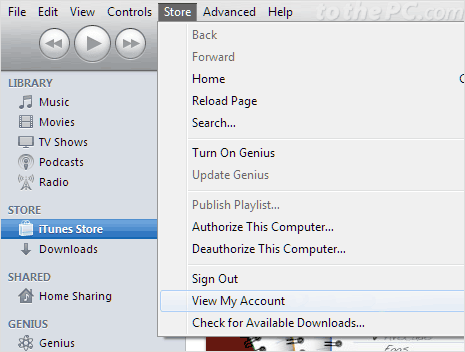 Open iTunes program on your computer system. On the top menu, goto Store > View My Account option. 2. You will show prompt to enter login password for your Apple ID. Enter password and click View Account button to continue. This will open Account Information page. 3. Check for Purchase History option with date listing of your most recent purchase. Click Purchase History button to view more details. 4. Next screen will show detailed history of purchases made using your Apple ID from the App Store. It will show App name along with price details. Besides the listing of recent app purchases, it also display previous app purchases for your Apple devices. It shows consolidated total amount spent on purchasing recent apps from App Store as ‘payment card total’. In case you find listing of app purchase charge which you actually did not purchase and is wrongly mentioned – click ‘Report a problem’ button at the bottom for the follow-up and get back amount credited to your account.